End-stage renal disease (ESRD) is associated with significantly increased morbidity and mortality resulting from cardiovascular disease (CVD) and infections, accounting for 50% and 20%, respectively, of the total mortality in ESRD patients. It is possible that these two complications are linked to alterations in the immune system in ESRD, as uremia is associated with a state of immune dysfunction characterized by immunodepression that contributes to the high prevalence of infections among these patients, as well as by immunoactivation resulting in inflammation that may contribute to CVD. This review describes disorders of the innate and adaptive immune systems in ESRD, underlining the specific role of ESRD-associated disturbances of Toll-like receptors. Finally, based on the emerging links between the alterations of immune system, CVD, and infections in ESRD patients, it emphasizes the potential role of the immune dysfunction in ESRD as an underlying cause for the high mortality in this patient population and the need for more studies in this area. Reduced renal function is a significant risk factor for cardiovascular events and death in chronic kidney disease (CKD) patients, and this risk is further increased when CKD has progressed to end-stage renal disease (ESRD) requiring dialysis initiation or kidney transplantation. Despite significant technical improvements in both hemodialysis (HD) and peritoneal dialysis (PD), the mortality rate in ESRD patients is still as high as 20% per yr in patients undergoing renal replacement therapy (1). The major causes of death in ESRD patients are cardiovascular disease (CVD) and infections, together accounting for up to 70% of all deaths in this patient population (Figure 1) (2,3). Although it is well established that a dysfunction of the immune system is induced by the uremic milieu, this ominous disturbance has not been systematically studied as a potential contributing cause of premature deaths resulting from CVD and infections in ESRD. 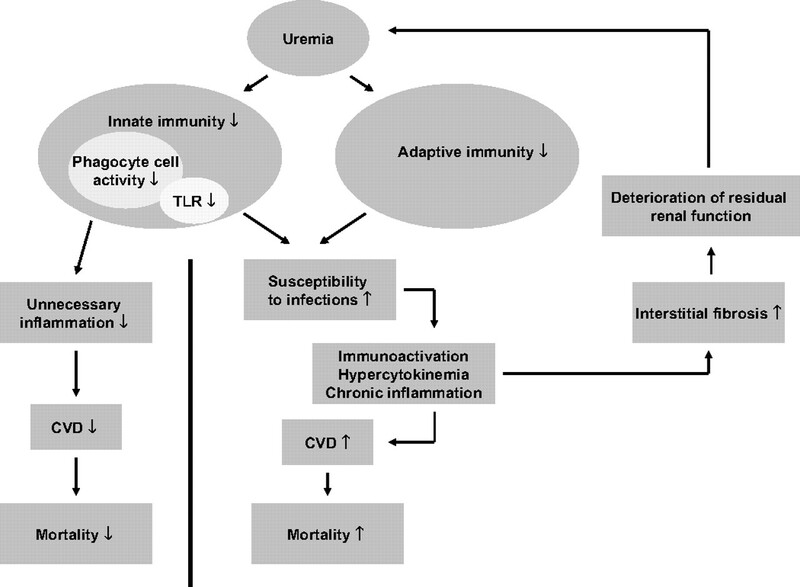 This brief review describes disorders of the innate and adaptive immune systems in ESRD and aims at exploring the possibility that a state of acquired immune dysfunction in uremia could be an important contributing factor for both CVD and infectious complications. Mortality caused by cardiovascular disease (A) and sepsis (B) of patients with end-stage renal disease (ESRD) treated by dialysis compared with the general population (GP). aBased on the figure by Foley et al. (2). bBased on the figure by Sarnak and Jaber (3). It should be noted that the immune dysfunction in uremia is associated with alterations in the two major branches of the immune system, innate and adaptive immunity. The innate immunity system includes recognition, phagocytosis and digestion of pathogens, induction of inflammation and presentation of antigens, whereas the adaptive immunity system involves production of antibodies and is associated with a memory of immune responses induced by the innate immunity system (4). The innate immunity system is a universal and ancient form of the host defense against infections. Innate immune recognition of pathogens is rapid and characterized by specific pathogen-associated molecular patterns (PAMPs) that do not require gene rearrangements essential in adaptive immune recognition (5). Receptors of the innate immune system are encoded in the germ line and are expressed on many effector cells, including macrophages and dendritic antigen-presenting cells (APCs). Once pattern-recognition receptors identify a PAMP, effector cells are triggered to perform their functions. Functionally, pattern-recognition receptors can be divided into three classes: secreted, endocytic, and signaling (5). Secreted pattern-recognition molecules function as opsonins by binding to microbial cell walls for recognition by the complement system and phagocytes. This class is represented by the mannose-binding lectin family. Its role is to bind to microbial carbohydrates and initiate the lectin pathway of complement activation. Endocytic pattern-recognition receptors are present on the surface of phagocytes. They recognize PAMPs on a microbial wall and mediate the uptake of pathogens into lysosomes, where they are destroyed. Macrophage scavenger receptor is a member of this class of pattern-recognition receptors and appears to play a significant role in the clearance of bacteria from the circulation. Signaling pattern-recognition receptors recognize PAMPs and by activating signal-transduction pathways they induce expression of a variety of immune response genes, including genes for inflammatory cytokines. The Toll like receptor (TLR) family belongs to this system. By activating nuclear factor κB (NF-κB), it exerts a major impact on the induction of immune and inflammatory response. Because TLRs are thought to link the innate and adaptive immunity (6), their role will be described separately. A schematic presentation of these three types of receptors is shown in Figure 2. A schematic presentation of secreted, endocytic, and signaling pattern-recognition receptors. (A) The lectin pathway of complement activation. Mannose-binding lectin is a secreted pattern-recognition receptor specific for microbial carbohydrates. Binding of mannose-binding lectin to its microbial ligands leads to activation of the complement cascade. (B) Endocytic pattern-recognition receptors stick to pathogen specific cell walls and mediate phagocytosis. The pathogens are digested into antigenic peptides and presented to the major histocompatibility complex (MHC) class II molecules on the surface of APCs. This complex is recognized by T-cell receptors, which leads to T-cell activation. (C) Signaling pattern-recognition receptors, which are represented by Toll-like receptors, recognize pathogen-associated molecular patterns. The activation via these receptors mediates induction of cytokines and costimulatory molecules, for example CD80 and CD86, on the surface of APCs. Thus, pattern-recognition receptors of innate immunity system are instrumental for the adaptive immunity system. The adaptive immune system has a more complicated and developed capacity for host defense (7). This response is antigen-specific and requires recognition of antigens in a process called antigen presentation. It rests on activation of two major types of lymphocytes, the T cells and the B cells. Naive T cells in the thymus gland and other reservoirs are activated by signals, such as processed parts of bacteria bound to major histocompatibility complex (MHC) molecules on the APCs. This turns them into functional T cells that display killing functions (killer T cells) and/or control immune response (helper T cells). B cells that bind specific foreign antigens turn into plasmocytes and start producing specific antibodies. After successful elimination of foreign pathogens, certain lymphocytes memorize the invading pathogen. This allows a strong response once the pathogen is detected again. To become activated, T cells require at least two signals from the innate immunity system. One is the complex of a peptide and an MHC molecule, and another is a costimulatory signal mediated by CD80 and CD86 molecules on APCs (8). Expression of CD80 and CD86 molecules is controlled by the innate immune system, especially signaling pathways through TLRs (9). It is when APCs express both antigen and CD80 or CD86 molecules that T cells become activated. Toll-like receptors (TLRs) belong to the family of signaling pattern-recognition receptors of the innate immunity system. They recognize various common pathogenic components, such as lipopolysaccharides (LPSs), peptidoglycans, RNA from viruses, and bacterial oligodeoxynucleotides (10). Their tasks include phagocytosis and activation of the complement pathway and of numerous cytokines, such as IL-1β, IL-6, and TNF-α (6). TLRs are also involved in the maturation of dendritic cells, which are APCs. Their primary function is to present the antigen to a lymphocyte, thereby inducing its activation. To achieve this, the dendritic cell has to express MHC and costimulatory molecules (CD80, CD86) on its surface. TLRs, when exposed to TLR ligands (pathogen antigens) up-regulate expression of these molecules, leading to dendritic cell maturation. This mature cell migrates to a draining lymph node where it is capable of activating naive T cells, thereby triggering adaptive immune response (6). TLR4 is probably the most widely studied receptor in the TLR family. This receptor recognizes bacterial LPS, a constituent of the cell wall of Escherichia coli, which is responsible for up to 80% of urinary tract infections. It has been shown that mice with defective TLR4 have impaired bacterial clearance during experimental pyelonephritis (11). In humans, TLR4 polymorphisms have been documented to be associated with an increased susceptibility to infectious disease including septic shock (12,13). Patients with a loss of function in the TLR4 gene are more susceptible to infections with Gram-negative bacteria (14). It has also been shown that Tamm-Horsfall protein activates APCs via a TLR4-dependent mechanism (15). Other TLRs have also been found to mediate an early immune response to invading pathogens. TLR2 reacts with PAMPs found in both Gram-positive and Gram-negative bacteria, and TLR2-deficient mice are much more susceptible to infections than their wild-type counterparts (16). TLR11, the most recently identified member of TLR family, has been found to be capable of preventing urinary tract infections (10,17). Alterations of the immune system in ESRD constitute a complex issue. On one hand, hypercytokinemia is a typical feature of uremia, likely due to accumulation of pro-inflammatory cytokines as a consequence of decreased renal elimination and/or increased generation following induction by uremic toxins, oxidative stress, volume overload, comorbidities, etc. (18,19). On the other hand, uremia is associated with immunosuppresion due to the impact of the uremic milieu and a variety of associated disorders exerted on immunocompetent cells. Disturbances described in the following sections are summarized in Table 1. All three classes of the innate immunity system's pattern-recognition receptors seem to be affected by ESRD. Significantly elevated levels of mannose-binding lectin have been documented in ESRD patients (20). This is of interest because a high mannose-binding lectin level pretransplantation is associated with worse patient and graft survival after simultaneous pancreas-kidney transplantation (21). On the other hand, in infected HD patients, low, rather than high, levels of mannose-binding lectin have been reported to be associated with increased mortality (22). We have shown that the expression of two major macrophage scavenger receptors, SR-A and CD36, is increased in ESRD patients (23–25). This could be a consequence of a chronic stimulation of macrophage scavenger receptors induced by inflammatory processes and/or by oxidative stress (25). Alterations of signaling pattern-recognition receptors, represented by the TLRs will be described separately. Disorders of the pattern-recognition receptors system in uremic patients result in impaired function of cells engaged in innate immunity, and there is a further impairment because of uremia as such. Ando et al. (26) have found that monocytes from PD patients are hyporeactive to LPS stimulation in comparison to HD and control subjects, as they produce less Il-1β and TNF-α. Monocytes and monocyte-derived dendritic cells have been shown to display decreased endocytosis and impaired maturation when cultured in uremic serum (27) or when obtained from ESRD patients (28). Anding et al. (29) have reported that the bactericidal capabilities of neutrophils are reduced in HD patients compared with control subjects. Because these abilities were to some extent restored by the HD procedure, the authors suggested that dialyzable substances might impair neutrophil functions. This impairment might be the result of the impact of uremic retention solutes on the balance between apoptosis and necrosis of neutrophils (30). It seems that some uremic retention solutes delay apoptosis and others promote this process. When apoptosis is delayed, neutrophils survive longer, thereby increasing host-defense capabilities against infections. However, such neutrophils are more prone to undergo necrosis, which is associated with a release of numerous pro-inflammatory molecules, leading to a state of low-grade inflammation. On the other hand, induction of apoptosis decreases necrosis-induced inflammation but at the same time diminishes the response against infections (30). Ig light chains are an example of uremic retention solutes that delay apoptosis in neutrophils (31). The process is also retarded by intracellular acidification (32). However, these anti-apoptotic effects are counterbalanced by retention of factors that promote apoptosis (30). These include advanced glycation end products (33), oxidized low-density lipoproteins (oxLDL) (34), and TNF-α (35). The net effect of the uremic milieu on the rate of neutropil apoptosis was studied by Cendoroglo et al. (36) who found that uremic plasma accelerates apoptosis in normal neutrophils. Apoptosis was also increased in neutrophils from ESRD patients in a study by Sela et al. (37), who also showed an increase in neutrophil priming in these subjects pointing to it as to a key mediator of low-grade inflammation in ESRD. A further characterization of uremic retention solutes with regard to their specific pro- and anti-inflammatory properties is certainly needed (38). ESRD gives rise to various cytokine disturbances and to a state of hypercytokinemia involving anti-inflammatory cytokines, such as IL-10 (19), as well as pro-inflammatory cytokines, such as TNF-α (19) and IL-6 (39,40). Deterioration of kidney function leading to reduced removal rate as well as increased cytokine generation are thought to be the major culprits for the increased levels of circulating cytokines in ESRD (19). Whereas the so-called interleukin hypothesis postulated that increased IL-1-mediated hypotensive episodes during HD already in 1983 (41), the main emphasis today is on the role of the uremic hypercytokinemia for the development of protein-energy wasting and atherosclerosis (19). In addition to uremia, membrane bioincompatibility and endotoxin leaks through backfiltration lead to complement and leukocyte activation in HD (42). Leukocyte activation promotes adhesion of granulocytes to HD membrane, which may lead to leukocytopenia (43). The increased rate of infections, together with an impaired response to vaccination and a common failure of tuberculin skin test to diagnose latent tuberculosis indicate that the adaptive immunity is weakened in the ESRD population (44). Studies performed in vitro show that T-cell proliferation is decreased in the uremic milieu (45,46). As mentioned, T helper lymphocytes (Th) play a crucial role in controlling the immune response. Th1 cells produce several proinflammatory cytokines, notably TNF-α, IL-12, and IFN-γ (19). 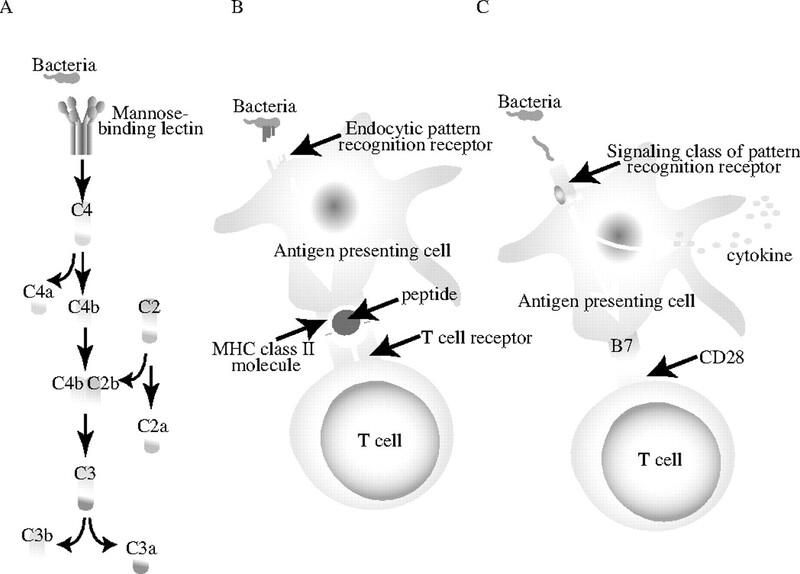 Th2 cells, in turn, produce mainly IL-4 and IL-5. By producing different cytokines, they have a diverse impact on the immune response (26). Th1 lymphocytes activate macrophages and neutrophils, whereas Th2 cells are involved in promoting humoral immunity. The balance between Th1 and Th2 is thought to be important in the progression of atherosclerotic lesions (19). In PD patients, the maturation of both subsets of Th cells is impaired compared with controls but also compared with HD patients. However, although the maturation of Th lymphocytes in HD patients is sustained, these patients still present with significantly elevated Th1 levels, leading to an increased Th1/Th2 ratio (26,47). A possible explanation for the increase in the Th1/Th2 ratio in HD patients could lie in increased production of IL-12, a monokine that acts on T lymphocytes by increasing INF-γ production and decreasing IL-4 production, therefore promoting their differentiation into Th1 type (47). It is now acknowledged that altered T lymphocyte function, found in ESRD, can be attributed to impaired function of APCs (44). Because T-cell activation by APCs is dependent to a great extent on TLRs, it will be described in more detail below. ESRD, and especially HD, is associated with B-cell lymphopenia. It has been suggested that one of the major causes of this disturbance is an increased susceptibility to the death of B cells by apoptosis (48). However, it has been documented that Ig levels, serum IgG isotypes, and both IgM and IgA production are normal in dialysis patients (44). A significant part of immune alterations in the course of ESRD could probably be attributed to the presence of protein-energy wasting (PEW) (49). This severe, yet common, complication of ESRD has been shown to correlate with increased morbidity and mortality in this patient population (50) and has been found to be related to lymphocytopenia and to impaired T lymphocyte function (51,52). It is now acknowledged that uremia decreases antigen presentation capabilities of dendritic cells and macrophages by alterations in costimulatory molecules (CD80, CD86) (53). Because their expression has been found to be regulated by TLRs, it seems plausible that it is a disorder in TLR expression and/or activity that causes the impairment of the functions of APCs. Indeed, TLR4 expression has been shown to be constitutively diminished in predialysis ESRD patients, especially in subjects who are predisposed to infections (54). Diminished TLR4 expression has been associated with reduced synthesis of TNF-α, IL-1β, IL-6, and IL-8 in response to LPS challenge (54). Similar results have been obtained in HD patients, and it has been suggested that, apart from uremia, endotoxins contained in the dialysate, by continuous stimulation, might eventually lead to a decrease in TLR4 expression (55). TLRs are also expressed on peritoneal mesothelial cells, as has been shown in our earlier studies (56). If TLR expression in the peritoneum of patients treated with PD is impaired, this could lead to diminished protection against peritonitis. This hypothesis, however, remains to be proven. There is a wealth of evidence that disorders of both innate and adaptive immune systems contribute to an increased rate of infections in the course of ESRD. Functional abnormalities of monocytes, neutrophils, and dendritic cells, described above, are directly linked with infection risk in this patient population (26–29,36). Impaired maturation of Th lymphocytes, seen in PD subjects, also leads to a disabled immune response and infection susceptibility (26). High failure rates for vaccinations against hepatitis B virus, influenza virus, Clostridium tetani, or Corynebacterium diphtheriae are also thought to be caused by alterations of T lymphocyte functions (44). As indicated above, TLRs are involved in the protection against urinary tract infections (57). Experimental studies have shown that TLR4 is required on intrinsic renal cells for effective control of ascending urinary tract infections (58). TLR11 has been documented to be present on uroepithelial cells and to protect against infection from uropathogenic E. coli in mice (17). Impaired TLR function in uremia might therefore lead to failure in preventing urinary tract infections. As urinary tract infections are common in ESRD patients with reduced urine volume, one could speculate that the impaired physical barrier (low urine flow) against invading pathogens in these patients, together with an altered TLR activity, might result in inflammation, contributing perhaps to a further loss of residual renal function. It should be noted that, whereas the impaired immune function in ESRD patients may reduce the risk for graft rejection following kidney transplantation and thus could represent a potential initial survival advantage, the immunosuppressive therapy in kidney transplant recipients contributes to maintain, at least initially, a different state of immune dysfunction. However, the immunosuppressed state of patients receiving a kidney transplant is beyond the scope of this review. An association between inflammation and CVD has been well documented (59), and there is also evidence for a causal relationship between infections and CVD (60,61). Therefore, it is possible that the immune dysfunction in ESRD could be linked to CVD through the above-mentioned associations with inflammation and infections as illustrated in Figure 3. In addition, there may be a direct impact of ESRD-associated abnormalities of the immune system on CVD progression. As mentioned above, uremia is accompanied by an up-regulation of the endocytic pattern-recognition receptors (23–25). Their representatives, macrophage scavenger receptors, apart from fighting pathogens, play a crucial role in clearing oxLDL. Increased expression and activity of macrophage scavenger receptors during ESRD might lead to enhanced oxLDL clearance and, as a consequence, to foam cell formation, an early step in atherogenesis (25). Alterations in pattern-recognition receptors could contribute to a state of hypercytokinemia, which is strongly associated with CVD and poor outcome in the ESRD population (19,62). The pro-inflammatory cytokines are thought to mediate PEW in ESRD patients (19) and are associated with indices of atherosclerosis (63,64) and with increased mortality rates (65). The precise mechanism(s) by which cytokines promote atherosclerosis in ESRD is, however, not clearly understood. They are known to up-regulate production of various adhesion molecules and, consequently, to promote adhesion of leukocytes to the vascular endothelium, which is an early step in atherosclerotic plaque formation (66). Other possible mechanisms include up-regulation of fibrinogen, lipoprotein (a), and CRP levels (66). 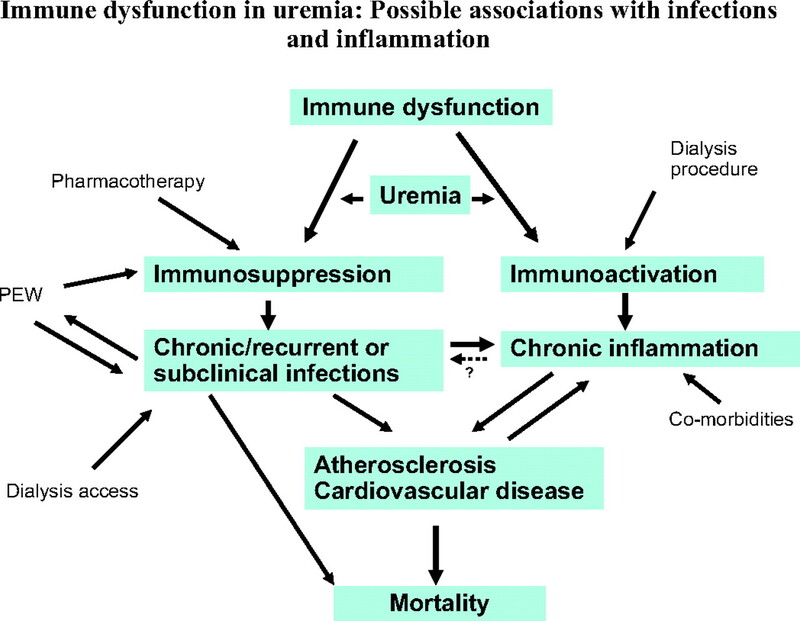 Potential links between the immune dysfunction in uremia, inflammation, infection, and increased risk of atherosclerosis and cardiovascular disease. We hypothesize that an immunosuppressed state, leading to increased susceptibility to infection, may lead to chronic inflammation and that inflammation may also ensue as a consequence of a state of immunoactivation. In addition, external factors, such as the dialysis procedure, dialysis access (blood or peritoneal) infections, medication, and PEW, may activate or inhibit the immune system. Associations between adaptive immunity disorders and CVD include the above-mentioned increase in Th1/Th2 ratio, found in HD patients (26,47), which is thought to be related to increased risk of atherogenesis and CVD (19). Seemingly paradoxical, a decrease in the activity of the TLR system may result in a decreased CVD risk. Kiechl et al. (13) reported that, although subjects with TLR4 polymorphism, which led to TLR4 downregulation, were found to be more susceptible to severe bacterial infections, they had a lower risk of carotid atherosclerosis and reduced intima-media thickness. These results suggest that impaired innate immunity might protect against atherosclerosis, thus resulting in lower cardiovascular mortality because of attenuated receptor signaling and diminished inflammatory response. If a similar situation is present in ESRD patients (Figure 4, left), ESRD patients with impairment of immunity may have a survival advantage in the form of a lower risk of CVD. On the other hand, if the patients confront invading pathogens, an impairment of immunity could lead to more severe infections and increased mortality because of infections (Figure 4, right). Possible impact of an impaired immune function in uremia on mortality. The right part of the figure demonstrates that dysfunction of the immune system may contribute to mortality, via increased susceptibility to infections and increased risk of cardiovascular disease. The left part of the figure shows an alternative scenario where an impairment in the immune function instead is associated with a lower degree of immunoactivation contributing to lower mortality through avoidance of potentially harmful consequences of an activated immune system. Uremia is associated with a state of immune dysfunction characterized by immunodepression that likely contributes to the high prevalence of infections among these patients as well as by immunoactivation resulting in inflammation that may contribute to CVD. Apparently, the immune system deterioration by itself or through predisposition to infections leads to inflammation and to an increase in the risk of CVD occurrence and progression. It is likely that the immune dysfunction in uremia significantly contributes to the high premature mortality in ESRD patients by mediating cardiovascular and infectious complications, the two most common causes of death in these patients. Therefore, measures aimed at attenuating immune abnormalities in ESRD should be a main research area as this could lead to amelioration of the, up to now, disastrous high death rate in this patient population. S.K. and M.C. contributed equally to the presented work.